Unsocialized: #JeSuisCharlie? Or Racist, homophobic, sexist rag? #JeSuisCharlie? Or Racist, homophobic, sexist rag? 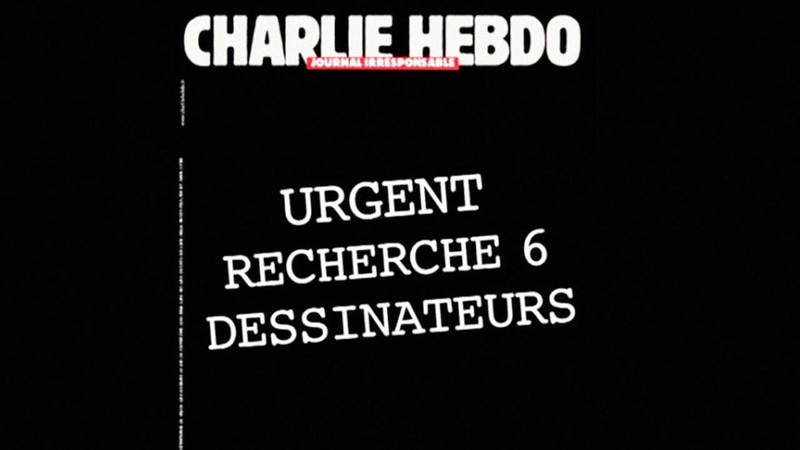 After three days, it seems there are now a lot of UK experts on the magazine "Charlie Hebdo." I'd never heard of the magazine. I had heard of the Danish cartoons, which Hebdo republished-and those have a book worth of context from right wing racism through to right wing middle eastern warlords to talk about. It is questionable as to whether those cartoons, obviously being used to raise tensions by both right wing westerners and by middle eastern warlords, should have been re-printed (even as support of their right to exist as pieces of political statement). But that’s my *opinion. * And my opinion, as I find more information and have more dialogue about a very complex issue, more complex than has been perhaps spoken about in British narrative, may change. As for Charlie Hebdo's own cartoons and its particular Parisian kind of "satire," what some British commentators are saying seems to be at odds with what French commentators are saying. The context of some of the cartoons have been explained to me- and without context, yes, the depictions on them without that context *look* racist. On the Boko Haram cartoon-I wanted to know answers, not make assumptions. This was one quite a few of my lefty friends had taken exception too. Like all satire I have enjoyed in the past,I know it can be mistaken by those it is attacking as something they support (eg The Pub Landlord, who attacks racism and "little britainism" is loved by some on the right; Loadsamoney during the eighties was held up as an ideal by some of those it was satirising, 'Til Death Us Do Part," etc) and at times by those it is defending it can be mistaken as attacking them. Add to this French culture, ie, unlike British culture that looks for a goodie and a baddie, French culture has more of an understanding and dialogue concentrating on the grey areas. Add to that, the Parisian culture of disdain for everything and everyone. I don't know enough yet to outright support Hebdo as a publication, but I certainly see enough grey to stop me from pronouncing it as racist. I do see it as provocative, and perhaps as an outsider as unnecessarily so. Hebdo, however, were operating in a wider context that many exploited and many knew enough of to get annoyed, or to rile others who had not enough of a historical understanding, eg the terrible French Algerian context. I think it is really important to know context. This thread goes some way in doing so with one particular cartoon. It is bringing two right wing issues together in one picture. What people have to try to do is NOT read a cartoon like they would read a photo (though, of course, photos can be read out of context as well). Satirical cartoons are complex. They make me uncomfortable, but so does Alf Garnett, a character right wing people quoted to back up their racism, when the intention was for him to say all of the ridiculous things racist people would say. The bringing together of the two rt wing issues in the Boko Haram cartoon shows how ridiculous the right wing are. That's the point. The point was the opposite of what we read when we read it out of context. Those in France who know the Front National’s statements and the arguments and narrative in the press against them, would know the context of the cartoon. As outsiders we misread them. All art has exclusivity of time, culture and issue. Context. 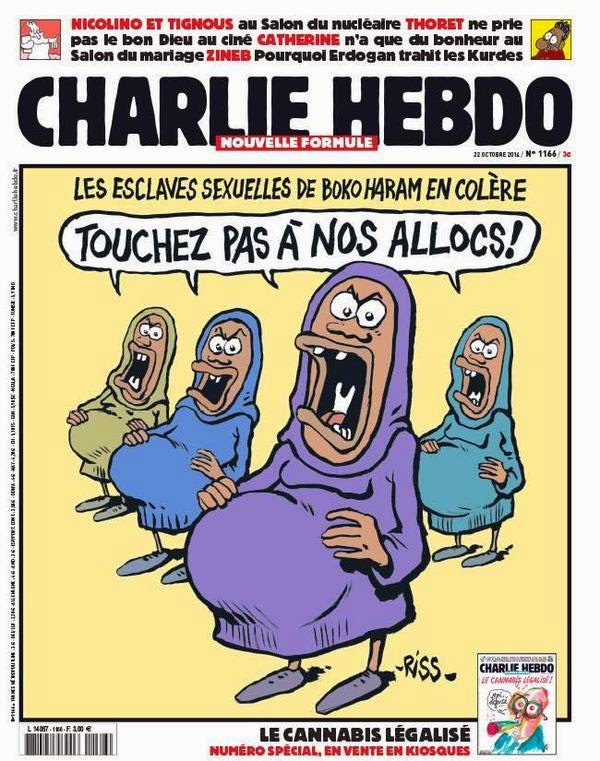 Charlie Hebdo, Charb, was saying to the right,"you are crying crocodile tears over these kidnapped women, because you attack immigrants escaping Boko Haram as being "welfare queens." You can’t have it both ways – by trying to you are ridiculous." This is the explanation I got from a French woman on facebook on another cartoon. "The middle one [the Rassemblement Bleu Raciste one, shown below] once again attacks the Front National, it reads "rassemblement bleu raciste" which refers to Marine Le Pen's movement "rassemblement bleu Marine"; the cover basically attacks the cover of the FN's journal which has been condemned for racism for saying Taubira (the woman on the pic) was "smart as a monkey" (in french "maline comme un singe, elle retrouve la banane"). They call Le Pen's movement "blue racist" instead of "marine blue"." 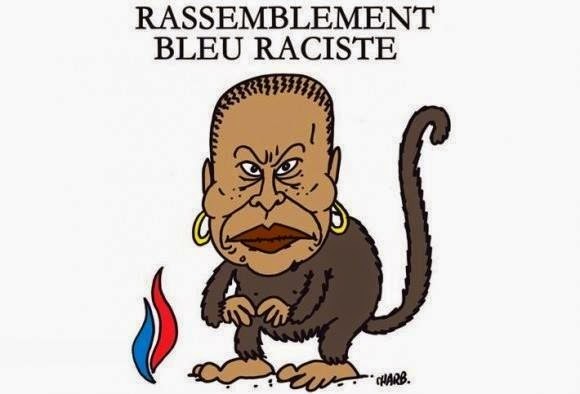 The Bleu Raciste cartoon is pointing out how racist and absurd the Front National’s words are words are. The words on the cartoon show up and accuse Marine LePenn and her party of being racist. Context is everything. This shows the racism contained in a FN magazine cover in graphic form. In other words, it is EXPOSING racism. Showing how racist their words are. Think of these cartoons as thought bubbles above the beads of a right winger, but labelled by an anti-racist. Read out of context of the French headlines at the time, to us, it looks racist. I think if we are attacking Charlie Hebdo, it should be, perhaps, over their naivety in thinking everyone will understand their attacks on racism; understand their position on free speech and also naivety in hoping that an oppressed minority will understand what look like attacks on them as actually exposing the right wing attacks on them. But I also think we as commentators should understand what they were saying, rather than trying to decode their words using our existing uninformed semiotic cues. It is like saying the roadworks sign (below) is a person putting up an umbrella. If someone had never seen that sign, and you asked them what it was, they could say that. But we know it isn't someone putting up an umbrella because we know the cues. It is part of our culture. We know the context. Most of my friends are highly politicised within the Scottish UK context. We would understand a cartoon that showed for example, Jim Murphy dressed from head to toe in tartan, with a saltire painted face, burning a union flag. We know this would be a satire on his recently found "Scottish patriotism," and the cartoon would be showing, to those in the know, how ridiculous this patriotism is. However, to an outsider, it is a pic of a Scot burning a union flag. 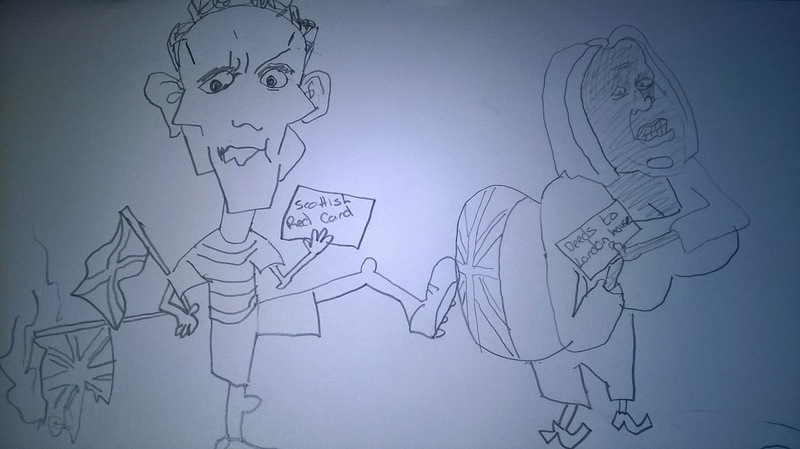 Or, this picture of Murphy in his football colours, kicking Dianne Abbott, who he had a spat with this week, could look to some, in the wrong context, ie someone not being party to the Scottish/Westminster political landscape, as a racist attack by a raving nationalist Scotsman. forgive the drawing! Just to make a contextual point! I am not saying people do not have the right to be offended by Charlie Hebdo, but I think before the rush to condemn the magazine as “racist, sexist and homophobic,” we should be trying to understand what they were saying. Or at least trying to say. I don’t know if they were or not. I just believe the story of this magazine is far more complex than we can rush to a judgment in three days. I would argue we, as outsiders are perhaps not reading Hebdo in the way Parisians will understand it. Certainly the pictures I have looked into are intended to be what the thoughts of Front National look like when realised. Place them inside a thought bubble and then place the bubble above Marine lePenns head- and then put the words underneath her; that is an easier way for us as outsiders to the media/cultural discourse in France to understand their intention -which is to show the ridiculousness of how racists and right wing nationalists etc think. Certainly the reported cover of the next issue bears that up.